Saxon is like a fine wine. These "dogs of war" may be as old as the hills but they just seem to keep getting better with age. Their longevity and contribution to Heavy Metal can only be compared to the likes of other NWOBHM bands like Judas Priest, Iron Maiden, Motorhead, Venom and Def Leppard. "The Eagle Has Landed III" is a double disc digi pack release that covers a lot of "killing ground". Unlike the previous "Eagle" releases, where those albums were compiled from a few shows, "The Eagle Has Landed III" is compiled from many different shows from many different venues throughout Saxon's 2004-2005 World Tour. Some of the cities these songs were recorded in are Stockholm, Nuremburg, Berlin, Hamburg, Fulda, Paris, London, Kiel and Wacken. There are a total of 35 tracks and there is a color page booklet containing many photos of Saxon in the live setting. The one thing that immediately attracted me to this album was the diversity in song selection. Many of the tracks on this release have never been available in the live sense before. CD 1 concentrates on classic Saxon from the first five albums, "Saxon", "Wheels of Steel", "Strong Arm of the Law", "Power and the Glory" and "Crusader". Some of the tracks that I was surprised to see included were "Redline", "Suzie Hold On", "Warrior", "This Town Rocks", "Play It Loud" and "To Hell And Back Again". CD 2 includes many songs from Saxon's last three albums "Lionheart", "Killing Ground", "Metalhead", "Unleash The Beast", "Solid Ball of Rock" and "Innocence Is No Excuse". Some of the stand out tracks here are "To Live By The Sword", "English Man 'O' War" and "Lionheart"
Overall, the performances are very good. Biff can still carry a tune. He is quite capable of hitting notes but plays it safe most of the time. The musicianship is as tight as ever. The recordings are pretty good but the main beef I have with this album is the mix. On some of the songs, the vocals and drums seem to be predominant. The bass is not as bottom end as I'd like it to be. As for the guitars…..these should be the out there! I feel they are too low and muffled in the mix at times. It's a shame because Saxon is a very guitar drivin' band and most of these songs would have sounded much better had they been cranked up a few notches. Compare this live album to "The Eagle Has Landed II" or "Greatest Hits Live" and you'll see what I mean. As with any live album, I'm very critical of song selection. Live albums give bands an opportunity to present songs in a different setting, even change things up a bit. I like that Saxon attempted to offer a variety of songs that have never been recorded live or available on live albums before. Considering they have quite an extensive catalog to work with, only so much could be included here. Of course we get some classics like "See The Lights Shining", "Frozen Rainbow", "Wheels of Steel" and "Crusader", which have been released many times already. Unfortunately on this round, songs from albums like "Rock The Nations", "Dogs of War", "Forever Free" and "Destiny" are overlooked. 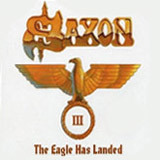 Being that the average price of this album is $16, "The Eagle Has Landed III" would make a nice addition to any die hard Saxon fan's collection. However, if you are a stickler for production values, you might want to sample some tracks before investing in this.